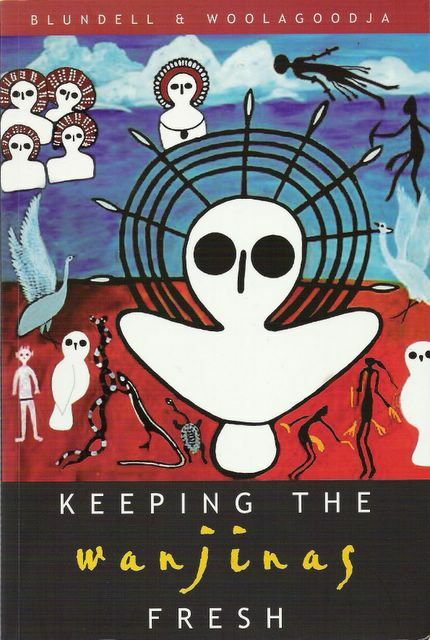 An excellent new book on the Wandjina (or Wanjinas) "Keeping the Wanjinas fresh" by Kimberely Wanjina artist & carer Donny Woolagoodja and anthropologist Valda Blundell strikingly documents the Wanjina rock paintings and the living tradition that is being keep "fresh" through "touching" up the old rock paintings and creating new "modern" expressions of the Wanjina - "eternal manifestations of the sacred life force ... the supernatural ancestors" of the local aborigines (including the Worrorra, Ngarinyin and the Wunambal). Donny Woolagoodja has a direct linkage to the "retouching" tradition through his father Sam Woolagoodja. The book highlights "the Wanjinas created the countries that their human descendants belong to and they made the laws that guide their everyday lives. Visible as paintings at hundreds of rock art sites throughout their countries, the Wanjinas remained sources of strength for Sam and his people during the tumultuos years of colonisation. Even after the Worrora were displaced from their countries, the Wanjinas continued to instruct them in their dreams." Further the book highlights "Expressions of the Wanjinas can be seen in the night sky, for instance the Milky Way. They are also closely associated with clouds and water ... Sam once told (Blundell) that the Wanjinas 'came through clouds'. "That's their home,' he said; 'they come from rain.' People are 'born in sunlight', while Wanjinas are 'born in the dark'. People around the world would have seen the Wanjina rising from the ground in the opening ceremony of the 2000 Sydney Olympics. Donny Woolagoodja was the traditional artist behind that extraordinary display. Most pivotal in the book, beyond the beautiful contemporary Wanjina artwork, is the "refreshing" tradition among chosen local people. I noted that Donny's "refreshing" of the the rock painting Wanjina Namarali at Karndirrim in 2002 made some "changes" to the old original representation, most noteably giving it a much thinner neck, a head leaning to one side and longer arms. I wondered about the importance of this but the book elaborates "while most of the Wanjinas have lost their mouths, they are still able to instruct people in their dreams. According to Donny, those aspects of recent paintings that appear to be 'new' are actually contemporary revelations of Lalai ("the primeval era of creation" or "the Dreaming" - an eternal sense of "living cosmology") . Donny explains, 'When I paint, I follow the dream.' "
The legends and lore of the indigenous aborigines also provide material suggestive of interactions with anomolous aerial phenomena. Of course, in speculation about such data, it should be realised that the accounts are of historical and anthroplological nature and therefore care should be taken not to interpolate too much into them. Aboriginal myths incorporate the idea of "sky-beings", with the Wandjina being among the most interesting to consider. The Wandjin have been preserved in a fascinating oral tradition and in a large collection of rock paintings scatteredthroughout the Kimberley region of northern Australia. The paintings have received all manner of interpretations from stylised representations of a pervasive myth system to naive "ancient astronaut" theories. It is however fascinating to see that the indigenous tribes viewed the Wanjina as "the spirit in the cloud". Indeed, the unique painting style shows a logical sequence from human figures to stylised representations of clouds. This duality of anthropomorphic form and "clouds" is widespread in primitive cultures and finds an interesting parallel in the biblical accounts in "Exodus". While this line of thought is suggestive of superior "sky beings" acting as cultural catalysts for primitive societies, I should point out that making mythological component comparisons, can make for interesting exercises, full of emotive similarities, but are purely speculative. Such speculations need to have their anchor points in the living and preserved traditions of the people who view the Wanjinas as their primary "religious" focus. To not do so is to ignore a primary and fascinating source of oral and pictorial knowledge about these extraordinary beings - the Wanjinas. Their resonances with some alien descriptions and contemporary alien abduction lore is fascinating. 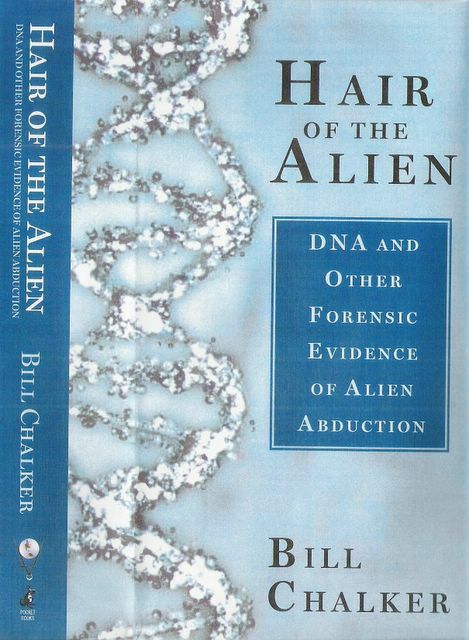 In my new book "HAIR of the ALIEN" I refer to a witness' description of entities, which was described by prominent "alien abduction" claimant Whitley Strieber as "the best description of the gray beings". For the witness - an Australian woman - "the most strikingly similar image to that of the beings is the Wandjina - the haunting Australian aboriginal rock paintings that reveal figures with large dark eyes and no mouth." In a previous article in IUR ("Strange Evidence," Spring 1999, pp.3-16,31), I adressed the issue of physical and genetic evidence for the abduction phenomenon. 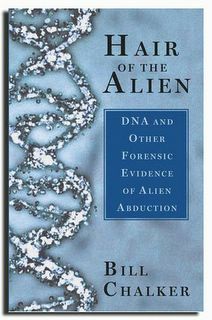 My forthcoming book Hair of the Alien: DNA and other Forensic Evidence for Alien Abductions, to be published by Paraview Pocket Books in July 2005, goes deeper into these topics. It uses the July 23, 1992, Peter Khoury case as a potent touchstone, and examines evidence in cases from diverse locations, including the United States, South America, Africa, China, and my home country of Australia. The UFO subject, and more particularly, the alien abduction controversy, are at the crossroads. Where we go from here will be critical for the credibility and future of UFO research. The title of this fascinating book "The Visible College" represents the obvious objective of all marginalised and hidden "invisible colleges" in diverse pirsuits. There are many "invisible colleges" within the UFO field - the direct result of ufology's image as "forbidden science" or marginalised science. Many scientists around the world contribute anonymously to further the cause of scientific investigation of the UFO mystery. Many undertake such efforts openly, sometimes risking their reputations in the bargain. Ann Druffel's excellent account of Dr. Jame's E. McDonald's "fight for UFO science" - "FIRESTORM" - is both a powerful statement of McDonald's extraordinary efforts and a sobering lesson of the possible costs of perhaps pushing the envelop too far. All of us who are committed to advocating serious scientific attention to the UFO phenomenon hope that some day the field of UFO research will not carry the stigma of borderline fringe activity. 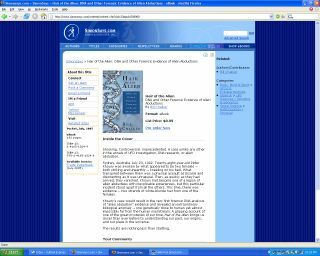 "The UFO Enigma - A new review of the physical Evidence" edited by Peter Sturrock (1999) represents an excellent statement of the potential scientific worth of the UFO mystery. At a UFO conference in Campbelltown, New South Wales, Australia, during February, 2003, I gave a lecture entitled "UFOs & Science - the Australian Experience" - a tribute to those who have contributed to the scientific investigation of UFOs in Australia. In that presentation I referred to Dr. Harry Messel (who advocated interest during the period 1953-54, but who now is very skeptical), Dr. Miran Lindtner (who carried out scientific investigations as part of the Sydney based UFO Investigation Centre, based in Sydney, until his untimely death in 1969), Harry Turner (nuclear physicist and intelligence analyst who fought a secret battle to bring science into official Australian UFO investigations), Dr. John Farrands (Chief Defence Scientist 1971-1977 who had an interest in the UFO subject), Dr. Don Herbison Evans (who developed a "UFO Indentification Kit"), Dr. Geoff Stevens (who applied thermoluminesence techniques to Australian UFO landing physical trace cases) and Dr. Michael Duggin (who worked with Harry Turner on the UFO problem and was a part of Allen Hynek's "invisible college"). Other scientists have contributed both publically and confidentially. These scientists have carried out their UFO contributions in a number of different ways, some from the invisible college perspective and others from visible college perspective. The choice is often dictated by concerns about job tenure and preservation of reputation given the uncertain dynamics and results inherent in revealing significant levels of active interest. UFO researchers should provide appropriate environments for scientists willing to make either sorts of contributions in postive and worthwhile ways. Hopefully at some point a kind of critical mass will be reached where there will not be any negative consequences of open expressions of serious interest by scientists in the UFO subject. Even now, with some noteable exceptions, the environment and reception for interested scientists is far from certain. "If Needham's gentle and sustained support of revolutionary China did not render him a dupe, neither did his obsession with the history of ancient China qualify him as an eccentric. Perhaps such a label was rather irrelevant in the case of someone who had already combined in his life a unique and continuing attachment to science and religion, communism and Anglo-Catholicism, and who moreover insisted on jumbling up these 'opposites'. 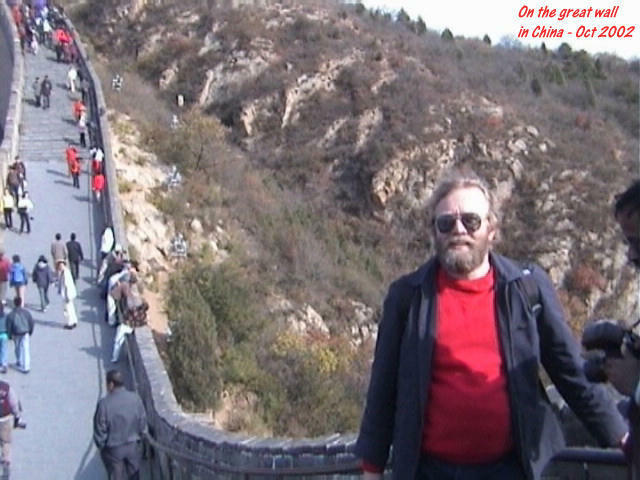 What has really rescued Needham from crankishness, however, has been the seriousness, scale and success of his now world-famous series on Science and Civilization in China. It is a work of prodigious scholarship, possibly, in the words of one reviewer, 'the greatest single act of historical synthesis and intercultural communication ever attempted by one man'." Robert Temple provides an accessible "summary" of Needham's work in "The Genius of China - 3,000 years of science, discovery and invention" (2002). "Surely it would be better to admit that men of the Asian cultures also helped to lay the foundations of mathematics and all the sciences in their medieval forms, and hence to set the stage for the decisive breakthrough which came about in the favourable social and economic milieu of the Renaissance. Surely it would be better to give more attention attention to the history and values of these non-European civilizations in actual fact no less exalted and inspiring than our own. Then let us give up that intellectual pride which boasts that 'we are the people, and wisdom was born with us'. Let us take pride enough in the historical fact that modern science was born in Europe and only in Europe, but let us not claim thereby perpetual patent thereon. For what was born in the time of Galileo was a universal palladium, the salutary enlightenment of all men without distinction of race, colour, faith or homeland, wherein all can qualify and participate. Modern universal science, yes; Western science, no!" 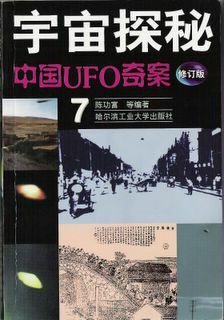 Given this perspective, returning to a UFO theme, more modern focuses, such as the newly emerging ufological manifestations such as in China, and others outside the Ufological heartland of the United States, and indeed of the newer ufology, represented by new and often much younger players, all have something to contribute to this fascinating subject. Equally the older ufological players, and even older UFO legacies, from much older cultures, can also contribute to our greater understanding of the UFO mystery. STALKED BY "UFOs" - Damned Orange lights! I was musing with George Simpson (Australian UFO Research Network representative for Victoria) yesterday about the orange light reports that occurred in the Melbourne Suburbs on Friday night May 13. He had had further reports and was wading through them. He had mentioned that some of the "strange, intricate patterns" made by the lights were like Chinese characters. I had to laugh. Here I was in Melbourne late last week and back again this week. Some of my activities during last week and this week included translation work on Chinese UFO material with some Chinese friends. An underwhelming coincidence of course - stalked by UFOs desporting themselves with Chinese calligraphy. Yeah ... right. Some accounts of the Friday night orange light mischief mentioned a Southern Cross pattern. I recollected getting those sorts of light patterns on Australia Day night back in the orange light hey days in Sydney during the early 1990s. Patriotic UFOs - I think not. I became certain then, and suspect now, that human prankters were behind the orange light outbreaks. Most reports in my experience, particularly the early 1990s deluge, showed a marked propensity for the weekends, starting with Thursday (latenight shopping? ), peaking on Saturday night and fading out by Monday. Again aliens tracking the human longing for the Great Australian pastime - shopping & the weekend. I don't think so. Most reports were attributed to garbage bag/flare/Jiffy firestarter combinations - the variations were impressive. All but a few were most likely this explanation. The remaining handful were a little more difficult to explain this way, so while I'm cautious not to "throw the baby out with the bath water" my eyes still tend to glaze over with the mention of orange lights. Good luck to AUFORN, VUFORS & PRA etc in sorting out the truth about the latest orange light infestations in Melbourne. Speaking of coincidence, or is it synchronicity in Jungian terms, I'll point out a couple that occurred to me while I was writing/researching "HAIR of the ALIEN". The first one occurred immediately after I had finished my chapter on the English contact case of Cynthia Appleton - a chapter I subsequently took out of the book (see my earlier post on this) - I stopped writing, went to my car, turned the radio on, and the first words were from a news report talking about a Sydney Police detective Matthew Appleton and his investigations of a murder case. I admit I stopped to listen, because I had, with researchers in England, been trying to track down Cynthia Appleton's son - Matthew Appleton. Of course I subsequently tracked down the Sydney detective. After he naturally enquired about my interest he confirmed he was about the right age, his family was from England, but he wasn't the lad we were looking for! The second coincidence occurred after I had been writing and researching the Credo Mutwa story - see my earlier post. He is a Zula shaman, more accurately described by the more obscure term (in Western terms) sangoma. I went out for one of my favourite pastimes - book scouring. There I was in a Parramatta Sydney antiquarian book shop looking across the row of Asian culture books. I digressed slightly to the African section. My first glance - a book called "Sangoma"! I can tell you there are very few accessible books on sangomas, so this rather amazed me, particularly as I had just finished working on Credo Mutwa the Zulu Sangoma's chapter. Well I don't read too much into this but if this sort of thing interests you check out Australian journalist Ken Anderson's books on coincidences. A couple of them even include UFO coincidences he and I shared. I thought some of the sections of the Great Wall I visited were steep. 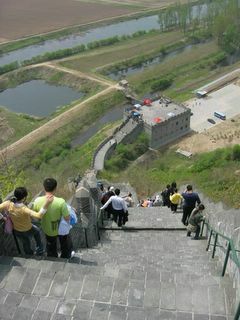 Get a load of Derrick Chang's shot from the Great Wall at Dandong, where locals can get a view of North Korea. Used with permission. 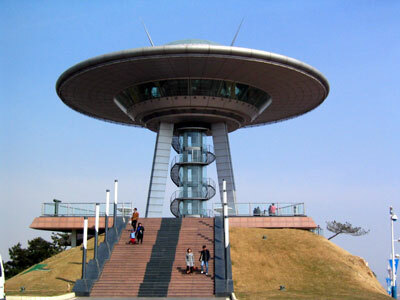 The previous intriguing photo is revealed as a striking UFO shaped viewing tower that overlooks the vibrant northern Chinese port city of Dalian - the locality of the UFO conference in September 2005. Both photos were taken by resident Derrick Chang, who kindly gave me permission to reproduce them. An ongoing investigation I have been undertaking in Outback Australia is attempting to verify claims of a mass witnessed UFO event that allegedly took place on the same day as the moon landing back in July 1969. The witnesses were claimed to be a large number of aboriginal children and women, along with two aboriginal missionaries. The story told describes the observation of a large UFO seen hovering for about half an hour. It then descended behind a hill. A large "mushroom cloud" went up from the spot. The two missionaries - names known to me - had been leading the flock in prayers, declared it was the "end of the world". The state of affairs that existed then and even now led to the event remaining unknown to white people in the area. However the event held sway over at least one of the children. 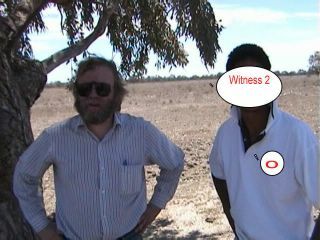 He approached me recently because his own son and about 5 others in an aboriginal hunting party came across a strange debri field. The locality turned out to be in an area that coincided with the line of sight of the 1969 "crash" some 30 or so years earlier. My primary informant became convinced that the recent "debri field" and the 1969 UFO "crash" event are linked. I have extensively interviewed him and two of the recent hunting party. We have undertaken 3 ground surveys over very difficult terrain and conditions. I undertook an aerial video survey with revealed some areas of interest. To date we have covered perhaps 20% of the target area, the nature of which suggests we would have to virtually walk directly over it to find it - no easy task given the locality and prevailing conditions. It is very difficult and exhausting work, however our investigations to date suggest it is worthwhile to continue pursuing the story and its alleged "UFO debri field". This enquiries in this area and over a much larger outback and near outback region has yielded some fascinating information that suggests a rich heritage of UFO and fortean type phenomena. In one area we have been looking into an intriguing photo anomaly recorded in a locality known for its strange aboriginal "sky being" lore and other strange features. The whole investigation has revealed a large amount of information about this fascinating strange heritage. 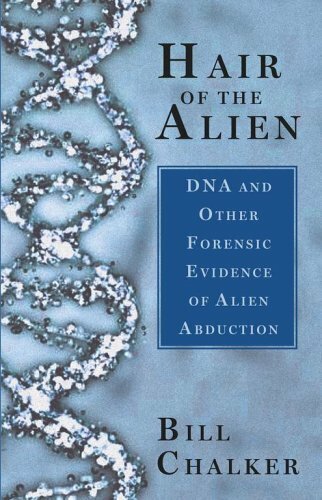 Possible sexual activity, genetic experimentation, and "hybrid" or "transgenic" beings have become dominant issues in the alien abduction controversy in more recent years. It is intriguing to note that there were other intriguing alien events, beyond the well known experience of Antonio Villas-Boas, that seemingly featured those elements as early as the late 1950s. Two such events are the strange story of English housewife Cynthia Appleton, which spans the years 1957 to 1959, and the bizarre alien claims of Credo Mutwa, an Africa shaman, that apparently occurred in either 1958 or 1959, which include what seemed to be a horrific variation of the Villas-Boas abduction and "seduction" story. 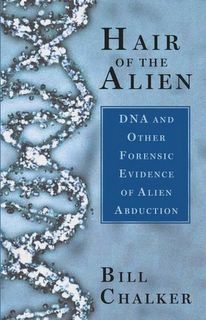 I researched both of these situations in detail while examining different aspects for my forthcoming book "Hair of the Alien - DNA and other forensic evidence of Alien Abduction." Ultimately it was felt the Appleton story diluted the forensic and scientific focus of the book and the section on it was deleted from the final book. Still the Appleton milieu is fascinating for a whole lot of reasons. 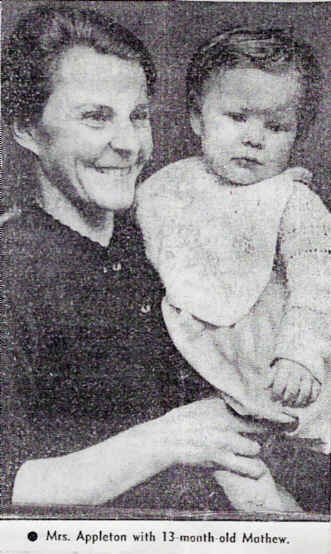 Andy Roberts who helped me out with some details has recently had a piece published on the affair in Fortean Times ("The Space Baby", FT191, November 2004) and this should be read along with my (article) ... to get two different and largely independent takes on this curious affair. The Credo Mutwa saga however is described in some detail in my book. I was specifically interested in the Appleton story because of its similarity to an Australian contact drama, which strikingly prefigures key aspects of the abduction drama not revealed until Budd Hopkins' book "Intruders" emerged in 1987 - such as "hybrid baby presentations" and the idea that a genetic breeding programme was at the heart of the abduction saga. This intriguing Australian story is also detailed in my new book. Both Cynthia Appleton and Credo Mutwa's stories have aspects that strain credibility. They assault our commonsense and one's inclination is to perhaps dismiss them. Despite their apparent shortcomings each reveal dynamics that resonate potently with aspects of my current research. They can be perhaps viewed as uncertain grist for the mind mill. One thing is certain. I suspect that had these bizarre events been subjected to the kind of general forensic approach, particularly using DNA techniques, that I have been advocating and using, we would be much more certain of their credibility or lack of it. Unfortunately the era and environs they occurred in precluded this happening. Was there a cosmic inspired Bethlehem visited upon an ordinary English housewife in an ordinary Birmingham suburb? Was this just a most exotic cover story for some fling? Or was it some suburban housewife's fantasy or over-stressed burnout response inspired by a mix of flying saucer tales, Sputnik maddness and Midwich Cuckoos. We may never know for sure, but if credible connected evidence such as a piece of alien skin (or even DNA related evidence of a "space baby" or "star child" which were claimed features of the saga) ever surfaced ... then maybe we could have a crack at where the answer really lay. The Zhang Jinping profile article describes one of his intriguing investigations with a "forensic" twist. 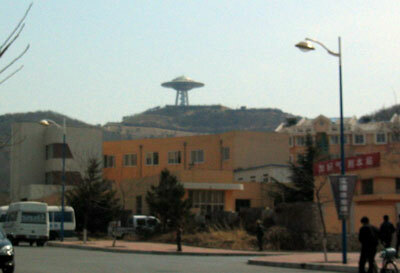 In December 1999 .... Cao Gong, a middle-aged man from Beijing, claimed to have been abducted by aliens and flown to Qinhuangdao in their UFO. "They looked like humans but had large hands and were very pale, " Cao said. He said he had met a Chinese girl in the flying saucer.Zhang's investigation began in April 2000. The first step was hypnosis. Zhang invited a famous psychologist from Suzhou and asked him to conduct hypnosis on Cao in helping him to remember the whole incident. Then he brought Cao to the Beijing Bureau of Public Security and gave him a lie detection test. "He passed the test," says Zhang. According to Cao, who is the principal of a private school in Fangshan District, he met a Chinese girl in the flying saucer, who looked around 13 years old. "The aliens cured her disease in the flying saucer," he claimed. In order to find the girl, Zhang brought Cao to the Tangshan Bureau of Public security in July 2000. 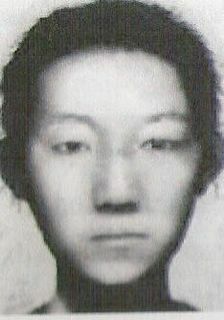 "The policemen made up a computer image photo-fit of the girl's face according to Cao's description," says Zhang. In November 2002, Zhang led a group of students from Beihang University and set out on a trip to Qinhuangdao, in search of the mysterious girl. "There was only a narrow glimmer of hope of finding the girl with only a computer image of her," says Zhang. They arrived in Qinglong County to the north of Qinhuangdao, and began their blind search among the county's 400,000 population. "Amazingly, we found a clue on the second day of our search. An old man in the county recognized the girl in our picture," says Zhang. They found the girl soon after that. She was 15 years old. Zhang brought her back to Beijing to meet Cao Gong. She was identified by Cao as the girl he had seen in the UFO. Zhang has now spent three years investigating this case. Zhang Jingping sent me an article which gives some personal background on himself - a energetic member of the Beijing UFO Research Association. "Looking for the Little Green Men"
Advertising is my occupation, but UFO research is my real career .... You wouldn't guess that Zhang Jingping owned a thriving private advertising company. He's got employees split up into two teams - TV and newspaper advertising. Not that they see that much of their boss. That's because in every spare minute, he returns to researching his pet subject: UFOs. "I devote most of my energy and time to my research. My manager takes care of daily affairs of the company," Zhang explains. "Advertising is my occupation, but the research is my real career." Credo Mutwa - Zulu Sangoma - "alien abductee"
This is the cover of the original edition of Credo Mutwa' "autobiography" "Song of the Stars - The Lore of a Zulu Shaman" edited by Stephen Larsen (Station Hill Openings, Barrytown Ltd, 1996, recently republished as "Zulu Shaman - Dreams, Prophecies, and Mysteries (Destiny Books, 2003). 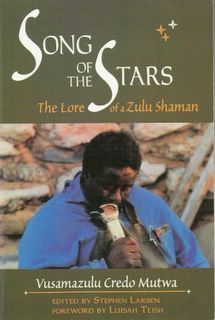 This book is a fascinating read and includes Credo Mutwa's UFO stories and encounters. In my forthcoming book "Hair of the Alien" I describe Credo's UFO legacy in some detail and also include an interview I did with him. His UFO story is an intriguing case study of the UFO contact and experience dynamic revealed against the rich tapestry of African culture. "What are we to make of Credo Mutwa's "alien" stories. Credo Mutwa's stories emerge from a culture marked by a distrust of whites, a distrust of authorities, a strong focus on oral histories rather than written history, and an awareness of taboos and forbidden or hidden knowledge, known to the few initiated shamans, but experienced by the many - men and women all over Africa." 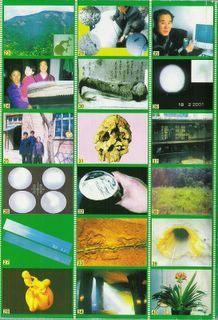 - from "Hair of the Alien"
This Chinese magazine sent to me by Zhang Jingping of the Chinese UFO Research Organisation describes the Meng Zhao Guo abduction story in detail. Meng claims to have been struck by a beam of light from a UFO and experienced an abduction and sexual relations with a female alien near Harbin during 1994. His case has become famous in China and recently Time magazine (September 2003) reporter Matthew Forney wrote, tongue in cheek, "Forget China's astronaunts. The country's most famous intergalatic traveler lives in the last house on his lane at the edge of a Siberian forest." 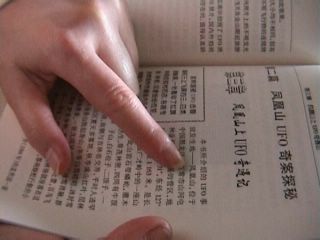 I have been working with a Chinese friend here in Australia to translate the bizarre story. I also describe this and other stories from China in "Hair of the Alien". 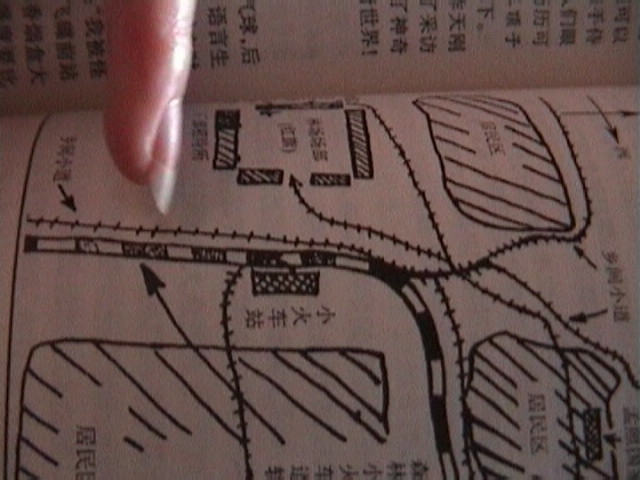 Pointing to the map outlining the Meng Zhao Guo story my translator describes some of the strange features of the episode - while the UFO event was witnessed by other locals, much of Meng's experiences seems to have been only seen or experience by him. 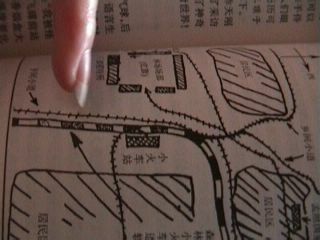 My translator assistant points out the details of the Meng Zhao Guo story. Many elements strain credibility but the story of the Harbin area timber worker is a fascinating case study of a bizarre abduction story from another culture - China - a country which is increasingly making a significant impact on our perceptions of the UFO controversy. APEG - a biochemical variant of the UFO "invisible college"
... by early 1998 my circle of "invisible college" colleagues had expanded to include some scientists from the biochemical field. They were cautiously interested in UFOs, but mindful of the subject's stature as "forbidden science," they insisted that their involvement would need to be conducted strictly on an anonymous basis. The biochemists were well established in their field, with well-regarded peer-reviewed publications and research. But job security and peer respect are powerful inhibitors of open declarations of interest, particularly given the long and sorry history of science in the UFO controversy. 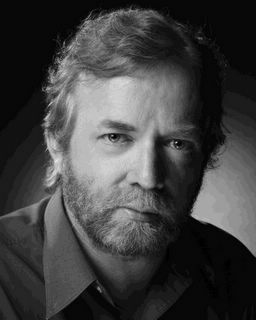 Because I had an existing and reasonable public profile and strong and established connections with key researchers worldwide, our group, which called itself the Anomaly Physical Evidence Group (APEG), decided that I would be the public face of this biochemical variant of the UFO "invisible college." Since then the group has studied a number of pieces of biological evidence allegedly involved in UFO experiences. 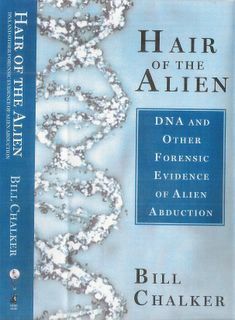 These included the hair sample from Peter Khoury's extraordinary 1992 encounter in Sydney, Australia, another hair sample case from the mid north coast of New South Wales, the controversial "alien claw" from California, and the unusual stain on the dress worn by Betty Hill in her famous alien abduction experience. These cases and others are discussed in my forthcoming book "HAIR OF THE ALIEN - DNA and other FORENSIC EVIDENCE of ALIEN ABDUCTION". 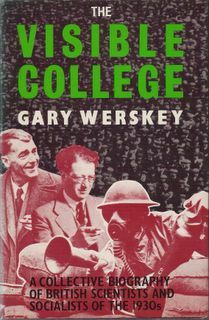 in 6 parts - approximately 104 pages of A4 text covering the official story from 1920 to 1984. 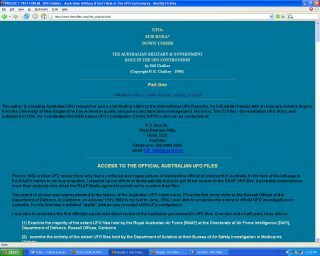 Beginning in January 1982 I examined a huge number of official UFO files at the Russell Offices of the Australian Department of Defence. 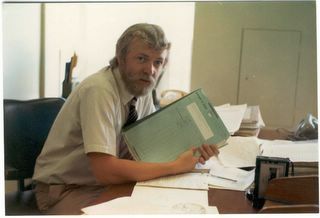 This photo shows me examining some of those files in the Russell Offices in Canberra, Australia. Dominic MCNamara of the Disclosure Australia Project took this picture of retired Australian Defence scientist Harry Turner and I in June 2004, during the interview I organised. Harry Turner's role is extensively described in my document UFOs SUB ROSA DOWN UNDER. 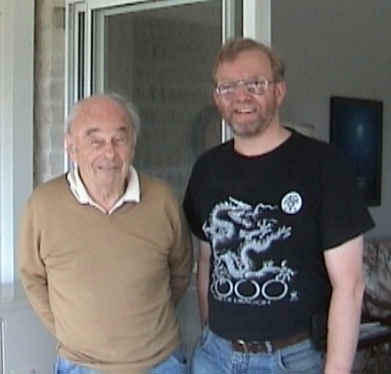 The Disclosure Australia interview of Harry Turner undertaken by Dominic and I was discussed in the September 2004 Disclosure newsletter available on line at the Projects web site. I had been in contact with Harry Turner since 1982 as part of my attempts to unravel the official picture of UFO investigations in Australia. A hitherto hidden dimension of Harry Turner's research will be described in my forthcoming book Hair of the Alien specifically his investigation of an Australian contact drama featuring a Canberra woman, which strikingly prefigures key aspects of the abduction drama not revealed until Budd Hopkin's book "Intruders" emerged in 1987 - such as "hybrid baby presentations" and the idea that a genetic breeding programme was at the heart of the abduction saga. These features were documented in a private capacity by Harry Turner, a nuclear physicist and analyst with the Australian Joint Intelligence Bureau (JIB) of the Department of Defence, during 1971-1972. He made his notes available to me in 2001 and since then I undertook a detailed enquiry into the story - see my chapter "An Early Abduction Odyssey" in Hair of the Alien. The Simon & schuster web site has posted the cover of my forthcoming book. The book will have 328 pages plus index and colour photo insert pages. Hair of the Alien? This is no bizarre variant of a "hangover cure" for UFO obsessions. But it may provide a "cure" for the lack of physical evidence that has plagued alien abduction research for the past four decades. What we are dealing with here is a fundamental refocusing of our perceptions of alien reality. 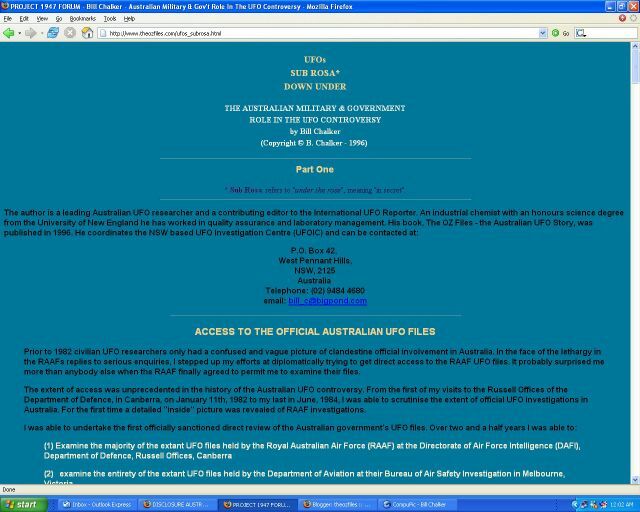 let me highlight that it is a detailed on line resource devoted to Australian UFO story and research.